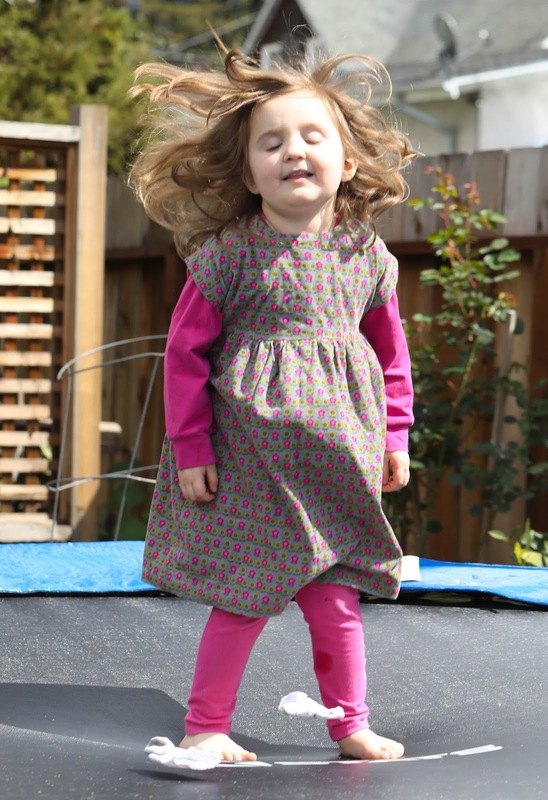 Inder Loves Folk Art: Playtime Dress, Kitty Shirt, and Happy Birthday Oliver + S! Playtime Dress, Kitty Shirt, and Happy Birthday Oliver + S! I'm back with some Maggie makes! Continuing on my stashbusting quest, I have had a one yard piece of this adorable printed corduroy in my stash for a loooooong time. It has a little bit of stretch, and I believe I bought it from Mabel Madison, a great (warning: not inexpensive by any definition) online fabric store that sources those super cool European fabrics you see in Ottobre magazine and the like. 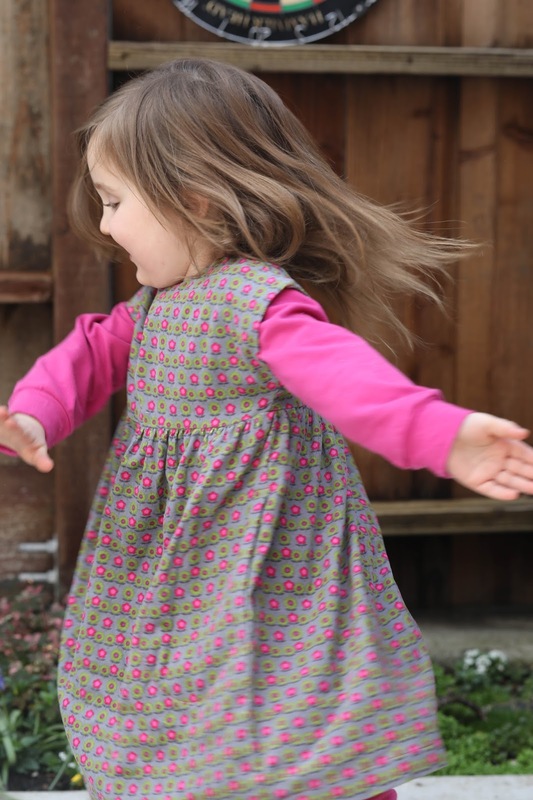 I decided to pull out a long-time favorite pattern I haven't sewn in a while, the Oliver + S Playtime Dress. I didn't have enough fabric to make sleeves, so I decided to make a cap-sleeved jumper. I drafted facings for the sleeve caps to echo the neckline facing, sort of like the Marilla Walker Maya Top. It made a really cute little jumper that can be layered over a shirt, under a cardigan, or worn alone. I've said it before, and I'll say it again, corduroy is such a pleasure to work with! It is a great fabric for a beginning sewist, because it behaves so well (just make sure to cut all your pieces going the same way and use a pressing cloth), and it has a lovely soft drape. 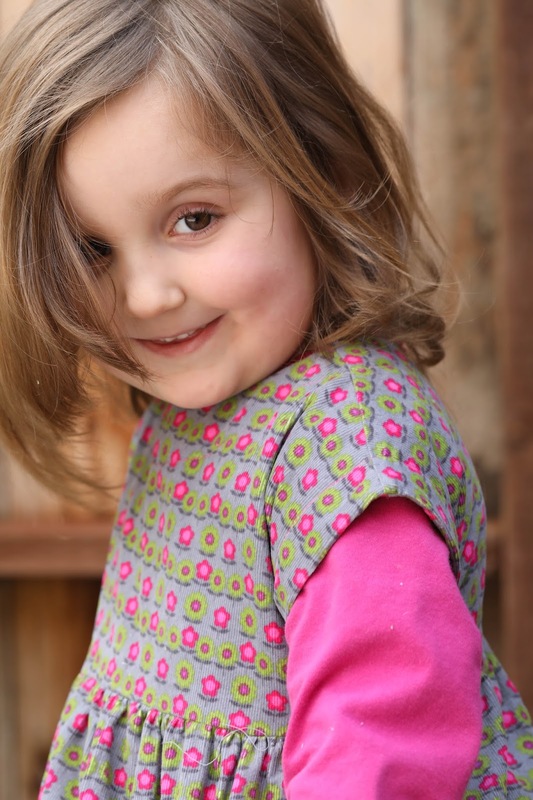 Maggie loves the soft fabric, the pink flowers, and, of course, THE POCKETS. "These are the best pockets in the world!" she announced on trying this dress on. I'll take that as a win! I wanted my topstitching to stand out more, so I used two pink threads threaded through a jeans needle to topstich the facings and hem. Because of the busy pattern of the fabric, the topstitching doesn't stand out as much as I had hoped, but it's definitely bolder than it would have been with just one thread. I calculated that I've sewn at least 33 separate Oliver + S styles, counting separates individually, and my blog has 75 some posts tagged "oliver and s." Several Oliver + S patterns are TNTs that I've made over and over and over. Eight years later, I still love sewing Oliver + S patterns. The patterns are reliable and versatile, and although not cheap, they are a great value. 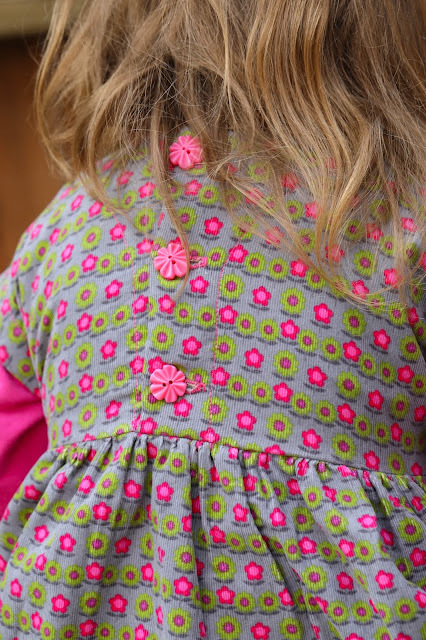 My kids have grown up in these patterns, and I love to see them still wearing them. Happy Birthday Oliver + S! I know the sewing world has changed so much in the past ten years, and the terrain is different now than it was in 2008 (I continue to believe that the great recession was the impetus for so many of us picking up sewing - we could no longer afford our old hobbies! ), but I hope we'll continue to see more patterns from Liesl in one way or another for another ten years (and beyond). The August 2017 issue of Mollie Makes came with a package of pretty vintage-style buttons, which Maggie has been asking me to put on a dress for her since they arrived. This jumper was the perfect opportunity to use them, and the dark pink flower buttons echo the flowers on the fabric perfectly. After I finished the jumper, I realized Maggie needed a long sleeved shirt to go under it, and annoyingly, I didn't have enough of the dark pink fabric I made these leggings from to make a shirt (I made a shirt for her from the same fabric two years ago, but it is basically in shreds now). So I went to Stone Mountain for another couple yards of raspberry cotton lycra (a staple in my sewing for Maggie), which unfortunately led to a hard fall off the no-fabric-buying wagon and I came home with 9 yards of new fabric! ACK! I blame this t-shirt, people. But seriously, this knit is super nice. Thicker than a Laguna knit, it has a good amount of lycra for stretch and recovery, but a nice beefy feel to it. I bought two yards, which goes a long way for Maggie, and I expect it will make nice sturdy leggings. My home printer is super slow and tedious to use these days, which has meant that I've been turning more to patterns I just have to trace, rather than ones that have to be printed out. I decided to try a new Ottobre t-shirt pattern for this, and went with the "Black Cat Tee" from Ottobre Kids 6/2016, #11. 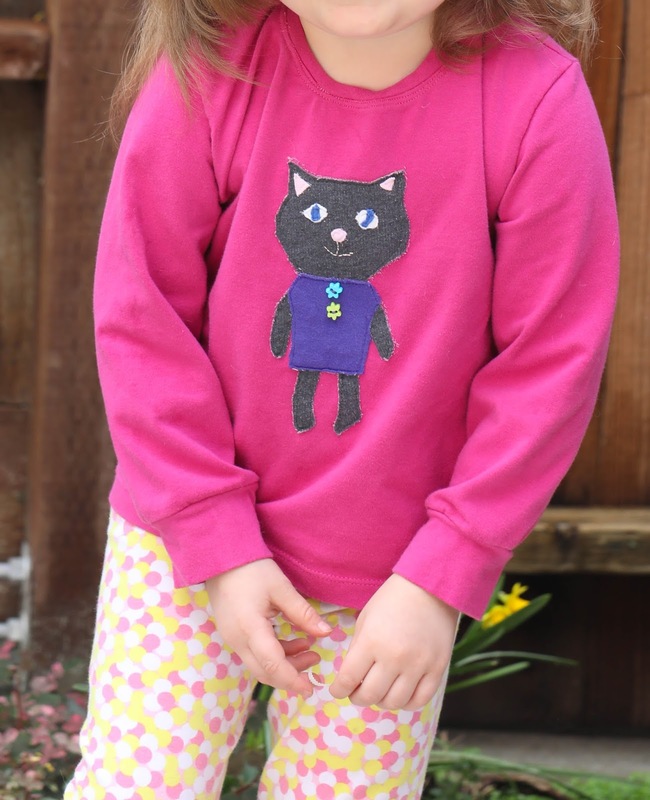 I chose it because it was a simple and basic long sleeved shirt, but Maggie noticed that the example in the magazine has a cat applique, which, of course, I was planning to skip! But my kitty-obsessed girl was in love! As she explained, "Everything is better with a kitty on it, mama!" Um, who can say no to that? So I agreed to do it, and we decided to make it a girl cat in a purple dress. I used fusible web to stick the pieces to the fabric, and then attempted to stabilize the back of the applique with Sulky Sticky + Stabilizer. This did a great job of stabilizing the area while I was sewing the applique on (I used a basic straight stitch), but unfortunately I did not read the instructions and didn't realize I wasn't supposed to apply heat to it. I ironed another piece on my applique with the stabilizer adhered to the back, and this caused it to super bond to my fabric. When it came time to "tear off" the tear-off stabilizer, it wouldn't budge in the areas that had been exposed to heat, i.e., most of the head and torso of the cat! UGH!!! And the stabilizer was pretty thick and stiff, although Maggie was willing to look past it and wore the shirt all day anyway! I was hoping that a wash would loosen the adhesive, and thankfully, it did. When I pulled it out of the washing machine still damp, the stabilizer peeled off pretty well, and even better after it air dried (I didn't want to risk having the heat of the dryer adhere it even more). Now there are only a few small spots where the stabilizer is bonded on. I'm hoping it will eventually wear off, and I can iron some interfacing/backing over the applique to remove any roughness. That drama aside, Maggie loves this shirt! 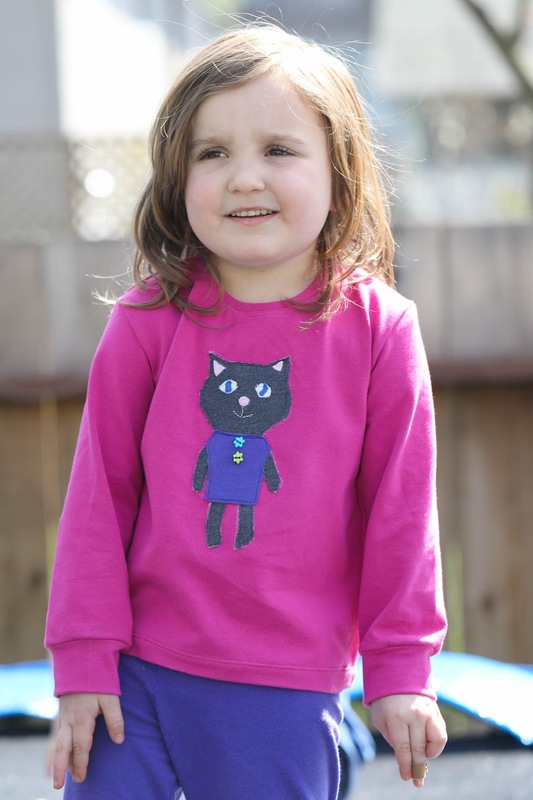 I like the relaxed fit of this pattern and will use it again for sure, and she loves kitty!! She's right - everything is better with a kitty on it! All the leggings shown in post were made by me, from Ottobre 1/2017 - #3, "Baggy." This is a great one-piece legging pattern with a slightly baggy bottom. I've made a million pairs mostly becuase it's so easy and I have the traced pattern sitting out on my sewing area! 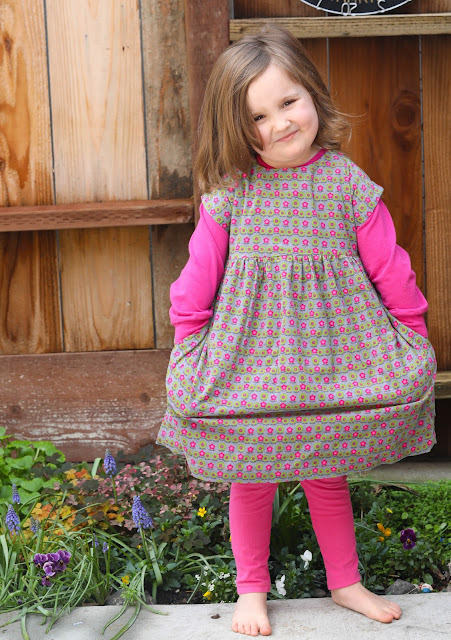 The largest size in this pattern is Maggie's size (size 98) so I'll have to find a new leggings pattern soon (the Playtime Dress comes with a great one, I just didn't happen to have the tracing sitting around!). Chances are good that if you comment on this blog, I met you through the Oliver + S online community! Most of all, I am so glad to know and follow all of you! What was your first and last Oliver + S pattern? Inder, I had no idea you’d been blogging for so long! How fun to see baby Joe all the way back in 2011! 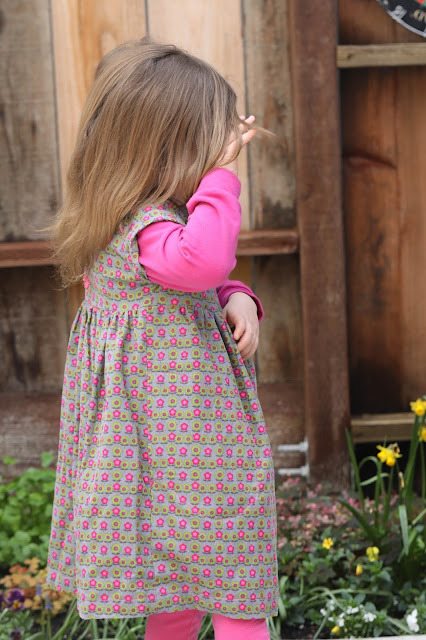 I haven’t made nearly as many Oliver + S patterns as you but I’ve made a decent amount of them and I agree that I alway learn something new from Liesl’s instructions. My first was the Tea Party playsuit for my oldest when he was tiny. 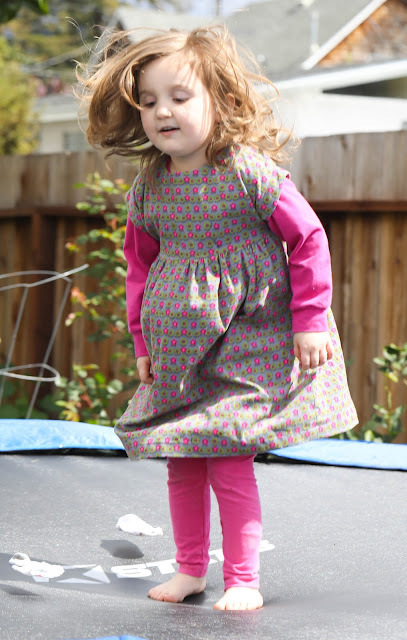 My most recent was the Playtime dress for Caroline. I can’t wait to make her more of that dress— it’s so cute and fun to sew. I love that you made a jumper from the pattern. I have some corduroy in my stash that would be perfect for that. Imitation is the sincerest form of flattery, right? 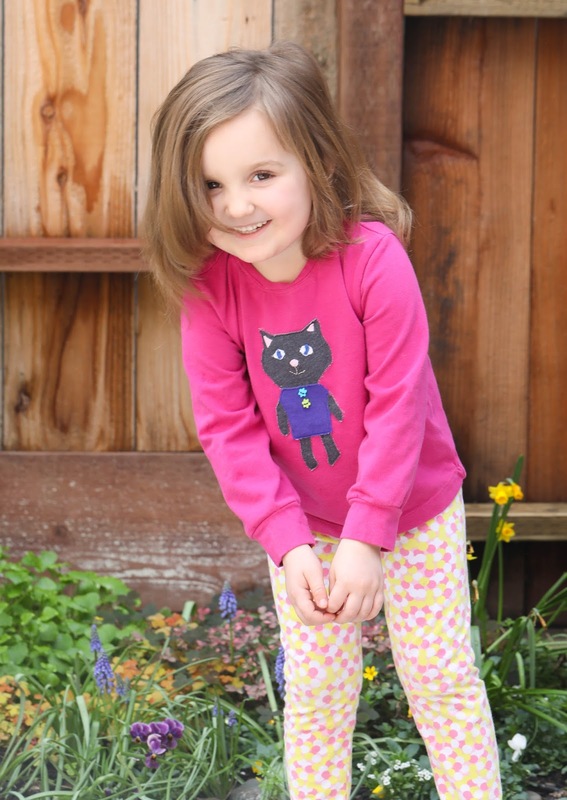 The kitty shirt is so, so cute, too! Yes, my blog is actually really old! It predates Joe by a bit, although it's a bit cringe-y to look back that far, I was such a baby blogger, lol! I had no idea what I was doing for like the first two years. Once I committed to being a sewing blog, life got easier, ha! I really like the Playtime as a jumper. I wasn't sure how I would like the capped sleeve over a shirt, but it ended up being the best part of the make, it's interesting and different! Thanks for being my blogging friend all these years! Love the dress - so perfectly Miss Maggie! Likewise, Justine!! 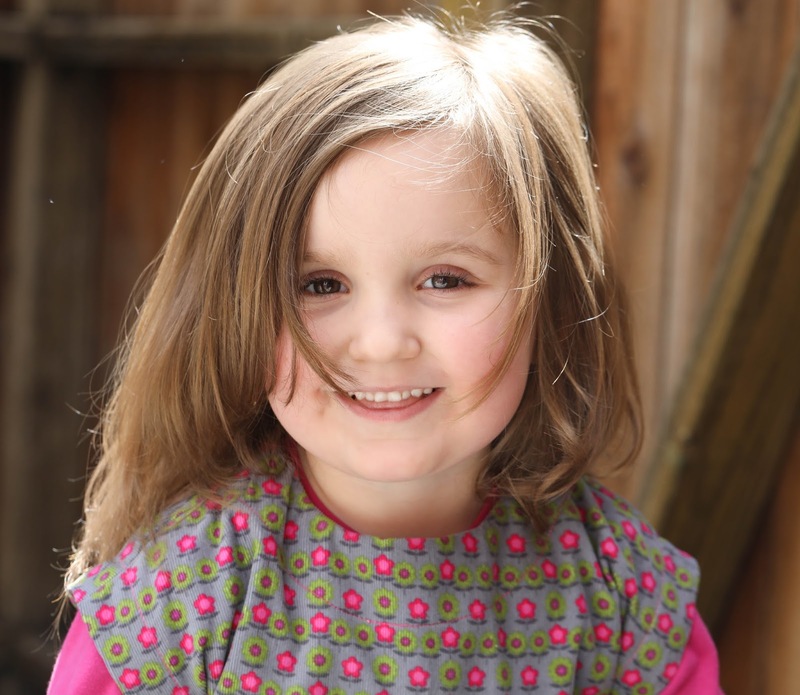 Your kid sewing was such a huge inspiration to me back in the early teens, and now you've become the queen of sewing for yourself, and you're still a huge inspiration! And so say al of us! Such a lovely long post! Beautiful pictures, projects, flashbacks. Ahhhhhhh, what a great accompaniment to Sunday coffee! So much cuteness in this post! I love that dress so much. Both of my girls would be thrilled to own it. I should really make another Playtime soon. That kitty tee is adorable; I love the appliqué. And baby Joe! Ack! The Sailboat was my first O+S pattern too, and I also made my first pair in red! The Sailboat is STILL just such a great, classic pattern! It still reads like expensive boutique-wear, when it's actually a really simple sewing pattern! I need to make a pair for Maggie before she sizes out of the smaller sized pattern! And red is a classic choice for some sailor pants. We just have good taste (duh). Thanks for the compliments on the tee! I think it turned out well! I'm trying to up my applique game, but I need a different stabilizer, lol. The dress is such a basic sew, but you can't go wrong with a Playtime. This is all so cute! Love, love the kitty applique and glad the stuff is coming off the back! And I can just see how lovely that corduroy must have been to sew with. Hmm. I need more opportunities to sew with corduroy in my life! I haven't actually used many O+S patterns due to only having boys but the Sketchbook Shorts pattern was pretty well used there for a while. In fact I think my current go-to shorts/PJ shorts for the big boys is still a self-graded-up version of the basic Sketchbook shape! Jane, you have no idea how happy I was when that &#$% actually peeled off the back of the t-shirt! I thought it might be on there for good! I am trying to up my applique game a bit (never my strong suit) but I guess I still need to research products! Love the jumper! I haven't sewn with corduroy in a while, I should make something soon! My first Oliver + S was the Field Trip cargos and Raglan. I love the cargos, and I've made tons of those raglans over the years! 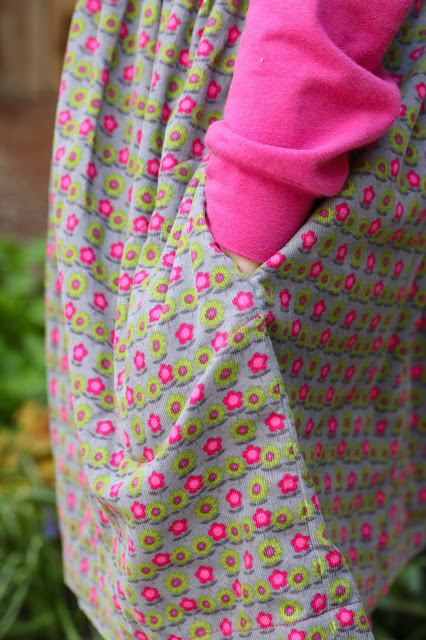 Such a great way to use small bits of leftover knit fabric. Corduroy is such a pleasure to sew with. I loved it as a newbie sewer because it is easy to sew and drapes so nicely (much better than the quilting cottons I was inclined to try to sew with). I love it now for the exact same reasons! Two tops and two skirts.